Companies and talented persons in blockchain and fintech, which are increasingly touted as new industries that could create jobs, gather in one place. Here, companies can meet talent wishing to be specialists while jobseekers can verify - on the spot - excellent firms having entered or preparing to enter these sectors. 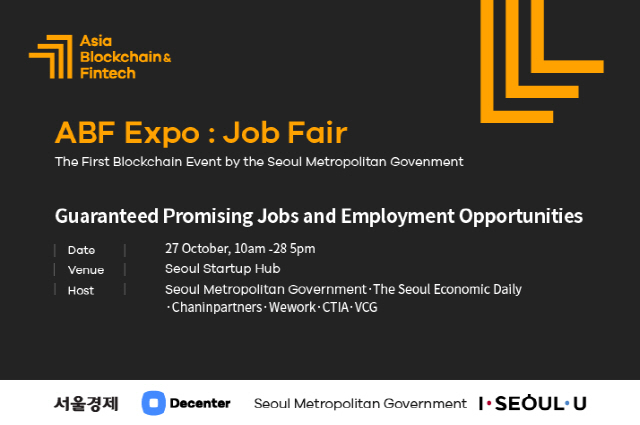 The Seoul Municipal Government and the Seoul Economic Daily will hold a job fair at the Seoul Startup Hub in Mapo Oct. 27-28 as part of the Asia Blockchain & Fintech (ABF) in Seoul 2018. The job fair is intended to address the problem of information asymmetry between companies looking for talented persons in blockchain, fintech and IT and competent jobseekers. It will provide Korea’s talent with opportunities to go abroad as foreign companies from such countries as Japan and China as well as Korea take part. Visitors can have questions and answers in person on corporate status and vision with officials from the companies to be present in the job fair. Companies, for their part, can have chances to publicize them and look for talent. Businesses and jobseekers will be free to exchange opinions and pre-matching programs will be available to allow visitors to speak with the specific employers they want. If a jobseeker visits the fair after registering his or her resume in advance, the ABF secretariat will arrange a one-on-one match-up based on the relevant company’s job information and the applicant’s resume. In a nutshell, there will be a face-to-face talk between a specific company and an applicant. Jobseekers can apply for visits to the fair and pre-matching programs free of charge. Organizers will provide 100 people in order of application among those who register resumes in advance with admission tickets to the ABF “Fuze 2018” event worth 550,000 won each at 30,000 won. Applications will be possible through onoffmix pages. Companies can take part in the job fair in various ways. The ABF secretariat will answer inquiries about this. Melephant, Yes24, Glosfer, WeWork and Chain Partners have already applied to take part in the job fair. “This event offers a forum for employers and jobseekers involved in new technologies leading the Fourth Industrial Revolution to meet. Pre-matching programs will help raise the likelihood of employment,” an ABF official said. The inaugural ABF in Seoul 2018 will be held at the Seoul Startup Hub, Shilla Hotel, Sebitseom and WeWork Oct. 27-Nov. 1. The Seoul Municipal Government, Seoul Economic Daily, Chain Partners, WeWork and Japan’s CTIA and VCG will co-host the blockchain and fintech event. It will be the first blockchain event to be hosted by Seoul City.